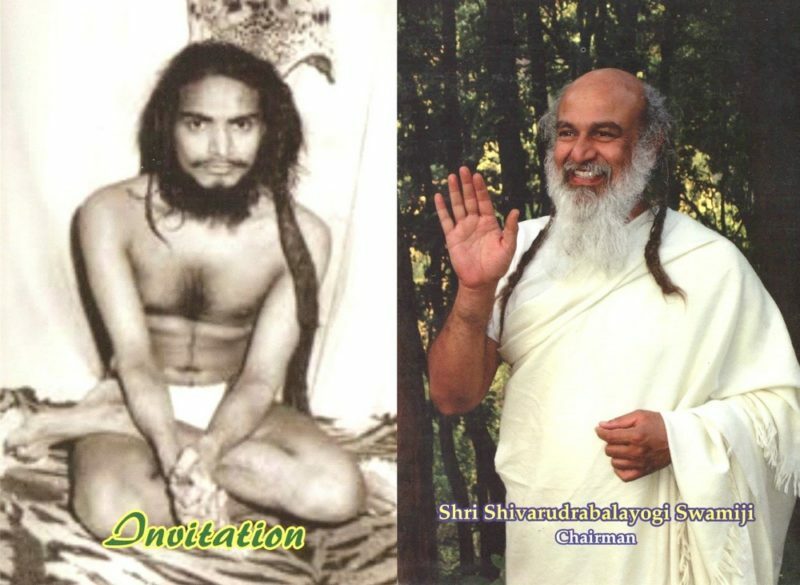 Shri Babaji’s message on the auspicious occasion of beloved Guru Shri Swamiji’s 83rd Birthday. 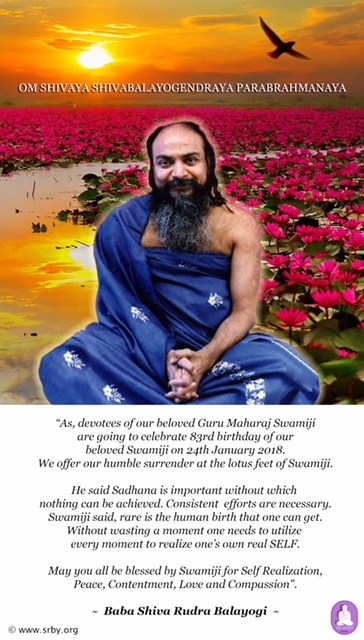 The Devotees and Trustees of Shri Shivabalayogi Maharaj Trust cordially invite you to participate in the auspicious Divine light 83rd Birthday of Shri Guru Shivabalayogi Maharaj. 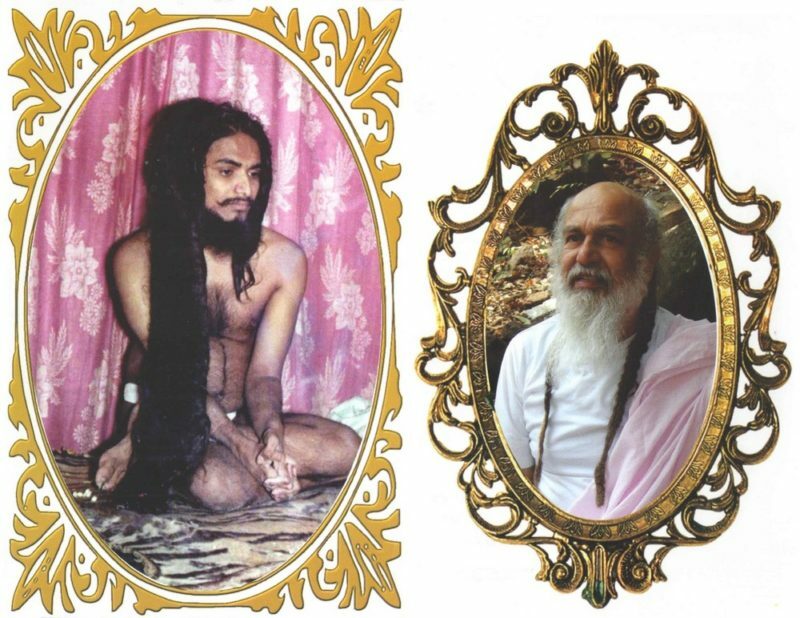 Devotees from all over the world will be celebrating in Dehra Dun, Bengaluru, Devarayasamudra, Anantapur, Hyderabad, Guntur, Adivarapupeta, Sambarlake, Jhansi and various ashrams, centres in India, U.S.A, England, Switzerland, Australia, Singapore, in the cities of Rawang, Ipoh, Sitiawan etc. in Malaysia, Singaraja Bali and Jakarta Indonesia. 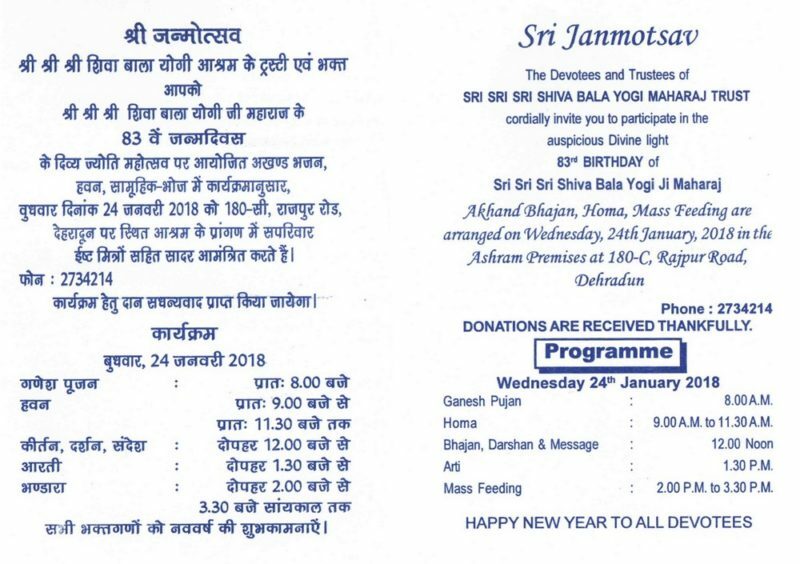 The Trustees and Devotees of Dehra Dun Ashram will be celebrating in the benign presence of His Holiness Shri Shiva Rudra Balayogi Maharaj. Programs consist of Special Puja to Shri Guru Maharaj, Meditation, Homa, Messages, Swamiji’s teachings, Bhajans and Mass Feeding of Maha Bhog (Blessed Food). Bhajan, Darshan & Message 12.00 Noon. Mass Feeding 2.00pm to 3.30pm. 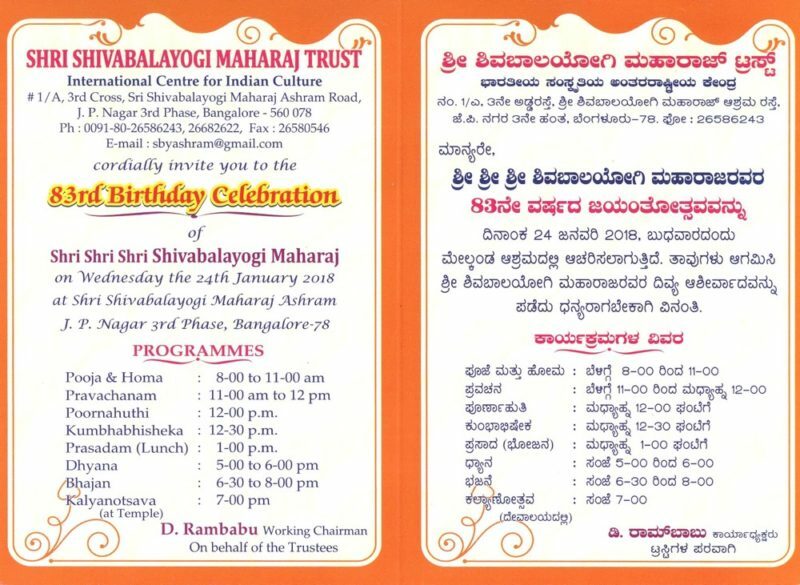 The Trustees and Devotees of Bengaluru Ashram will be celebrating with programs of Special Puooja to Shri Guru Maharaj, Homa, Poornahuthi, Bhajans, Meditation and Mass Feeding. Bangalore – 560 078 India. Pooja & Homa 8.00am to 11.00am. Pravachanam 11.00am to 12.00 Noon.